I am the type of person that can get out of bed and eat breakfast. In fact there are many mornings my first thought of the day is … I am hungry. During the week when I have to rush off to work I like to keep it simple; cereal and maybe toast and juice, but on the weekends I like to change it up a bit. 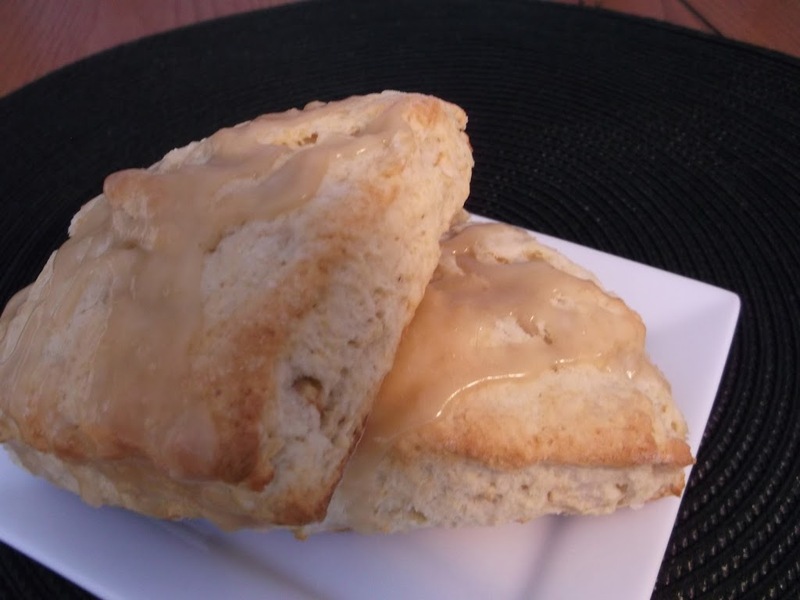 This past weekend was one of those weekends that I had a craving for some delicious scones. I love scones, but I don’t make them too often (not sure why not, they are not too hard to make). I couldn’t decide what type of scones to make. When I noticed a couple of apples in the refrigerate that were going bad, my decision was made. 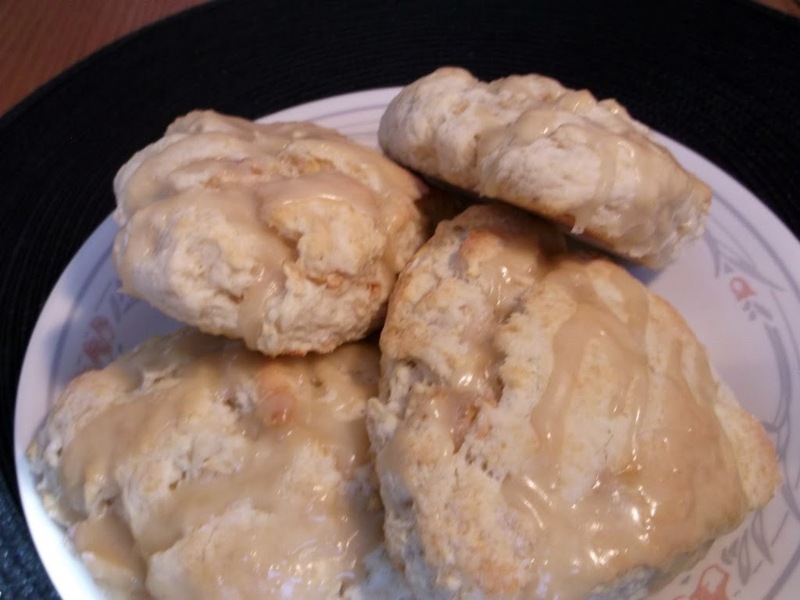 I didn’t have any recipes on hand for apple scones, so I took a couple of recipes that I have used before and modified them to come with this recipe for apple scones. I used a cup of finely chopped apples, which made the scones a little moister than the ones that I have made it the past. One thing I will change the next time I make these scones is I will add a little cinnamon to them, but overall I think they were a success. My family gobbled them up. We were going to visit my mom that evening so I saved one to give to her. She had never eaten a scone before so she decided to cut a little piece off and sample it; she was going to save the rest for her breakfast the next morning. But once she took her first bite, she liked it so much she ended up eating the whole scone. Combined the flour, baking powder, sugar, and salt in a large bowl. Add butter and blend butter with a pastry blender or by hand so that the mixture is crumbly. Mix together the egg, milk, and sour cream; pour liquid mixture along with the chopped apples into your dry ingredients and stir until well blended. On a lightly floured surface knead dough just enough to make a smooth dough (make sure not to over knead). Divide dough into two balls and pat into about six inch circles. With a knife (I used a pizza cutter) cut into four wedges. Place each wedge onto a ungreased cookie sheet, making sure that the wedges are not touching. Place in preheated oven and bake 12 to 15 minutes, just until scones are turning a light brown.While the scones are baking prepare glaze (directions follow). Once out of the oven place scones on cooling racks for about 5 minutes. Drizzle glaze over scones and let dry. Enjoy!! Add all ingredients to small sauce pan, over medium heat bring to boil. Turn heat down and boil for about 30 seconds, remove from heat and cool slightly. Add enough powder sugar (about 1/3 cup) to make a glaze. These scones would be a big hit with my family. 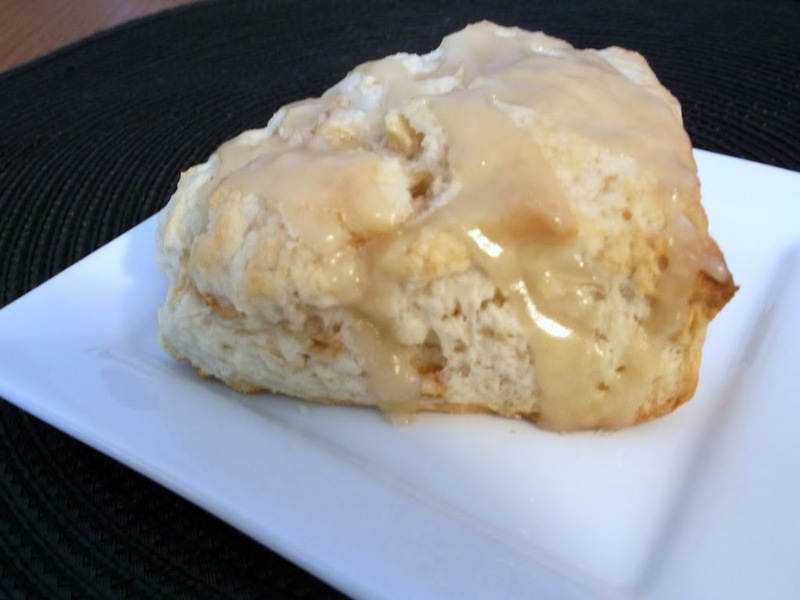 Apple scone…looks great, just want a cup of coffee to go with it. The first thing I think of is breakfast too! These look scrumptious! I’d get up early for one. Or two. Mary, Thank you for such a nice comment! Your mom’s response is the sign of a fabulous recipe!! I love scones…and yours look perfect!